The AcousticCurtain™ is a soundproof curtain that blocks outside noise, solving your noise problems at minimal expense and without disrupting the comforts of your home. 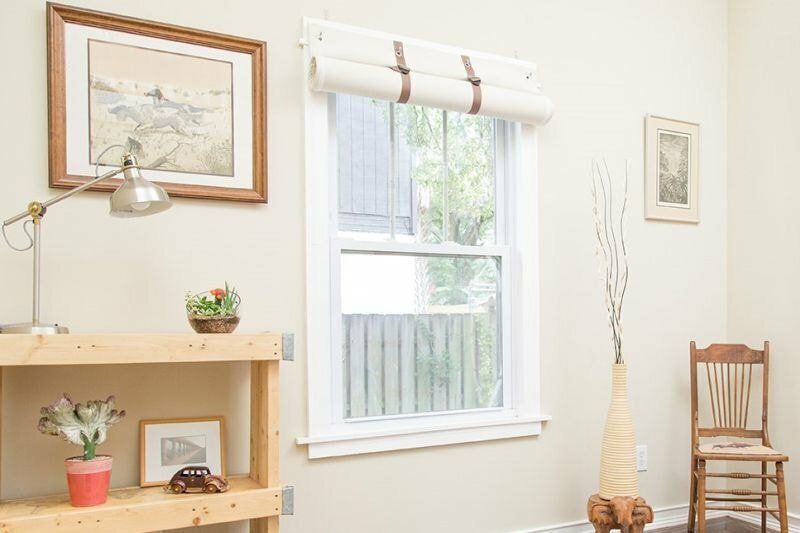 Each AcousticCurtain™ is hand-crafted and customized to fit the dimensions of your window. Premium Fabrics may take an additional 5 business days to ship. 1. Measure your window opening (width and height). 2. Add 8" to the width and height - the curtain will overlap each side by 4". This overlap ensures a snug fit without allowing sound to slip around the edges. Standard Production is 7-10 business days. Expedited Products will ship within 3 business days. How does a Soundproof Curtain work? While most sound-blocking curtains merely absorb sound, the patented AcousticCurtain™ actually deflects sound waves, directing them away from your living environment. This sound deflection makes the AcousticCurtain™ the most effective sound-blocking curtain on the market. In order to deflect sound the curtain uses a dense, flexible, sound-blocking core that averages between 10-15 pounds — although much smaller or larger curtains may vary. If you intend to retract the curtain every day or the window is placed very high up on your wall, the AcoustiTrac may be the best option for you. 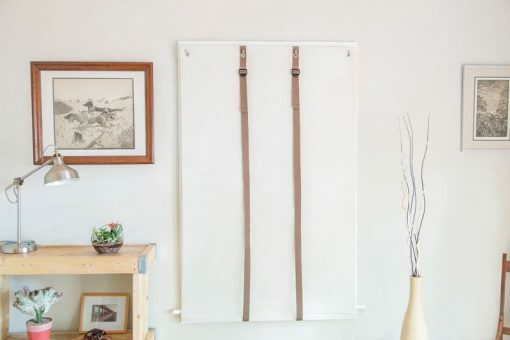 It contains the same sound-blocking technology as the AcousticCurtain™, but it retracts by sliding on a track rather than rolling upward to retract. How much sound does the Acoustic Curtain block? The AcousticCurtain blocks most outside noise, dramatically transforming your home’s atmosphere. To see just how much sound the AcousticCurtain blocks, check out this handy infographic. 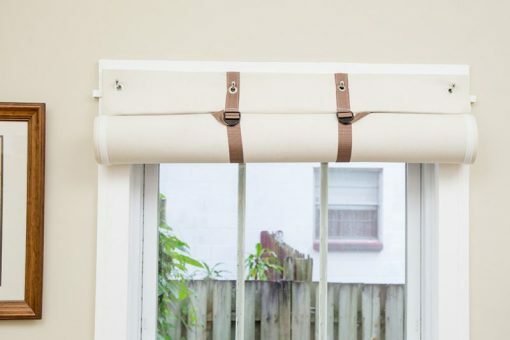 How do Soundproof Curtains attach to my wall? The AcousticCurtain is supported by grommets at the top, and comes with industrial hangers that can be nailed into the top of your window frame or your wall. 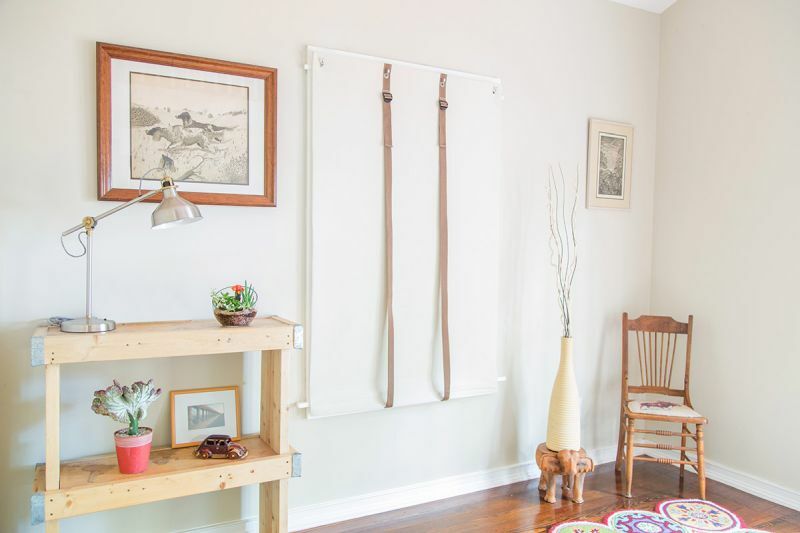 We have designed the hooks to minimize impact to your wall or frame, making the AcousticCurtain ideal for apartment or rental homes. We also offer premium hooks, if you prefer a more refined look for the curtain. The AcousticCurtain™ is held snugly against your walls using sewn-on micro-Velcro to ensure that sound doesn’t seep around the edges and into your living space. It takes less than 5 minutes to install and can be retracted with sewn-in straps when you want to let in light, sound, and fresh air. If you require ceiling mounted hooks, that’s not a problem! Request ceiling mounted hardware in the Order Notes section during checkout. Light-blocking: the AcousticCurtain blocks more than 99% of outside light. Many people purchase the AcousticCurtain simply to use for its light-blocking properties. Thermal properties: the AcousticCurtain soundproofing has insulating properties, lowering your home’s heating and cooling costs. Decor: available in a wide variety of colors, the AcousticCurtain™ pairs well with any living space. The AcousticCurtain and AcoustiDoor™ ship within 5-10 business days, although we often are able to deliver them sooner. If you can’t wait, or just want to block out the noise now, consider our standard-sized AcousticCurtain™. We keep these sizes in stock and guarantee they’ll ship within 1-3 business days of your purchase. We’d love to hear from you. Please contact us with any questions or if you’d like a free sound consultation. We also offer Quantity Discounts for our Commercial Customers. Tell us about your project! Blocks out the noise from my neighbors and the outside. These curtains looks great and are extremely effective. Fantastic product. Extremely effective and easy to install! These curtains solved my noise problems. I would definitely recommend them to others. Residential Acoustics delivers a high quality product that is extremely functional. Works exactly as advertised and looks great. I was able to customize the fabric to match my decor. Have already recommended to family and friends who could benefit. I hung this up in my bedroom and it did wonders! So happy I can finally sleep at night. The curtains really do help lessen the loud street noises in NYC. My only issue is that the hooks were not strong enough to hang the curtains–perhaps because my ceiling to floor length curtains were especially heavy. Fortunately, my handyman was able to reinforce the hooks with additional hardware, so my curtains are secure. I was very pleased with my purchase. The custom size was exact, the colors were exactly what I was expecting and the workmanship is perfect. I slept better the very first night we put up the curtain. I searched high and low for a way to make my home more quiet on the inside, no screaming kids, no barking dogs or loud freeway noise..I wanted it all on the outside, not in my home. Finally, I found this amazing company. Voila, got my curtains, noise stays out, quiet stays in…success. The curtain is very heavy, so I have to be careful putting it up and down, and not sure about the fabric, however, the curtain DOES do EVERYTHING it says its going to do..very, very pleased. We ordered with probably unreasonable expectations on sound dampening qualities, but it does work as advertised. We just live in an incredibly loud downtown environment. The difference the curtains make is substantial, just not miraculous like we’d hoped. We would certainly recommend, just know it’s not going drown out commuter trains completely. The production and shipping was fairly quick considering the size of the curtain we ordered as well. WE have loud barking dog next door and this curtain completely sound proofed this window. We covered the curtain with a white shear curtain, this way you don’t see the acoustic curtain. Thank you Residential Acoustic. Very happy with our curtain. It blocks out the noisy street and even lawn mower sounds are barely heard. It’s made extremely well. High recommend if you don’t mind a darkened room. I ordered the acoustidoor. It fit beautifully, was made of quality materials and put together well. It does a good job soundproofing the noise from the garage apartment. I’m very pleased. ust bought the curtains. Seems to be helping decrease the noise go through the doors. Might buy more. The process in which to order the acoustic drape was easy, so easy I was concerned that maybe it would not be right. When it arrived, it was was exactly what I expected, only better. Top quality and actually stylish. Great job, thank you! I purchased the curtain to quiet down my home office. I researched quite a bit and I ended up purchasing the sound curtain. When the kids are loud and scream my calls with my clients do not become embarrassing… For the price, it was the best way to make my home office more quiet. At first we were skeptical by what we considered to be a high price, but after receiving our order it was clear it was well worth every penny. I would highly recommend. No traffic in our small town, but really ANNOYING neighbors next door!!! Thanks a lot for the help! Awesome product, finally able to sleep without earplugs again! I live near a busy highway, and my neighbors have dogs that bark all night. Thanks to the curtain I purchased, I no longer notice. This product does not 100% block noise, but if muffles the sound, a lot, so much that you do not notice it like you would have before. I am going to buy more for other rooms in the house. It is made with care, expert stitching, very dense and heavy, took five minutes to install. In addition, the measurements I sent in were on the money! Customer service is excellent as well. I fine product, and excellent staff on hand to help. Getting a good night’s sleep is critical to one’s overall well-being, this product, honestly, helps me sleep better!